Photographer, 20 Grand Parade, St Leonards from 1903, if not earlier, to 1935, and also from about 1913 until about 1924 at 43 Western Road, Brighton. Hermann Stanham Warschawski was born in Brighton in 1875. His father was Paul Isidor Johann Warschawski, a Jewish emigré from Poland and teacher of Hebrew and German, who had converted to Christianity. His mother, Harriet, was the daughter of a Lincolnshire farmer and Paul's second wife. 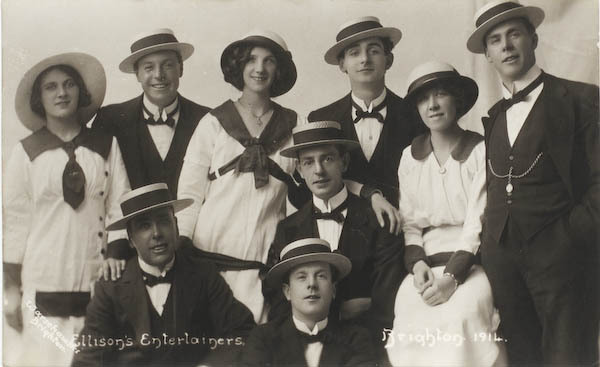 After leaving school and working briefly as an apprentice photographer, Hermann took over the running of the St Leonards studio on Grand Parade, where he specialised in child portraiture, but also published real photographic cards of stage plays, band performances and other entertainments. In 1906 he issued the "Warschawski Series" of picture postcards, which included a view of the SS Lugano on fire close to Hastings Beach (see Gallery). Cards from this series are now very hard to come by. In 1903 Warschawski changed his surname to Stanham, which was also his middle name and mother's maiden name. Perhaps he thought Stanham made him sound less foreign! During the First World War he served in France with the Royal Horse Artillery and also saw service in the Middle East. In 1915 he married Olive Colgate, the daughter of an Eastbourne doctor. The couple went on to have three daughters. Hermann died of cancer in 1935, aged 59. By 1936 the former Warschawski studio at St Leonards was being run by W.G. Hearn. Roy Hudson acquired it after the Second World War. This account draws heavily on ongoing research conducted by David Simkin. For further details of Warschawki's life and work as a studio portraitist you are recommended to visit David's website at http://photohistory-sussex.co.uk.